Latest News from Gamecreature: Rock On! So what did everybody get for Christmas? As you can see, GC got a new game. This is not a review so much as a commentary on the latest music and rhythm game, Rockband. It was developed by the same folks that brought us Guitar Hero, so there are a lot of similarities between the two games. So let's talk about the differences. Up to four people can play Rockband at the same time, and not all of them have to play the guitar. 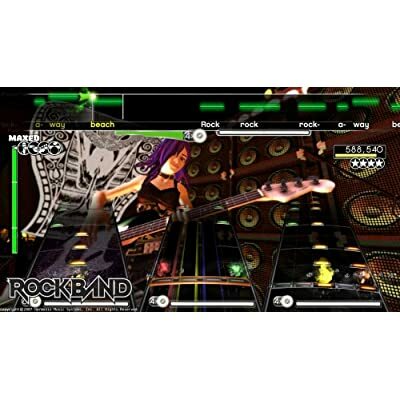 The game is bundled with a guitar, microphone, drumkit and a four-port usb hub so one can use all of those devices on the limited ports of the XBox 360. Folks who have purchased Guitar Hero needn't fret, as the game is designed to work with those peripherals as well. One of the big differences in gameplay is "solo" mode where you can strum, wail or otherwise rock til you drop without worrying about missing a note. Solos come at appropriate moments in the song where you can really show off and impress the fans. I may be exagerating just a bit in my cartoon - all of those artists are represented in that game and can be heard performing their greatest hits. Over 50 tracks in all. And not all of the songs hit the top 25 charts decades before today's teens were born. But hey, I gotta get my jokes from somewhere, right? But seriously, a lot of these songs will resonate more with the gamemaker's generation than the kids that are playing this game. As to the reason why this isn't an actual review - I haven't had a chance to play the game yet. And if things continue, it may be a while before I get the chance. Good thing I've got other things to occupy my time. Rock on, dudes!